It seems like Tolstoy-year these days because of the death of the author, a hundred years ago (round of applause, please). There is even a film about his last days. Any idea whether his idea of Christian anarchy will get some attention in the mainstream media? I'm not betting on it, he wrote from Las Vegas NV. 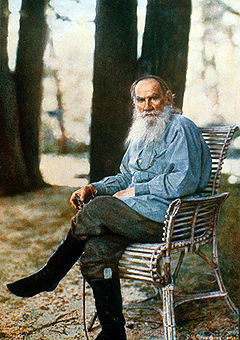 A rare specimen, Tolstoy. He held the strange idea that Jesus meant what he said. And so he taught: "Do not resist evil with evil." And: "Respect the personal integrity of each person." "Assume direct personal responsibility for the moral world which surrounds you. Never delegate your moral responsibility." "Seek out all opportunities for direct, creative ethical action." "Avoid violence, anger, the invasion of others, refuse bloodshed, and all kinds of theft and lies, covert or open -- especially in their approved and institutionalized forms." He wrote: "Christianity, which demands from its followers meekness, humility, kindness, forgiveness of sins and love of enemies, is incompatible with violence, which forms an indispensable condition of power." And: "War is so unjust and ugly that all who wage it must try to stifle the voice of conscience within themselves."